Residential burglaries are quite common in Malaysia. In KL, burglaries were found to occur mostly in single residences which have a neighborhood with large expatriate communities. Some burglars have entered the homes when the occupants were there, tied them up and threatened with weapons. While violent incidents during residential burglaries are rare, one U.S. citizen was killed in an apparent home burglary in 2013. Ensuring proper security of your property is an extremely important issue. Think over it for a while, and you’ll actually see that it’s not too difficult to get into most homes. Most residential robberies take place in broad daylight. The main problem lies in the fact that most properties have very weak points, which can be easily discovered and taken advantage of by seasoned thieves. Some weak points are actually very obvious. For instance, an open door, a casual but loud remark to friend “I just bought a brand new super cool MacBook Air!”, a tree within a few steps from your upstairs window, or even a window left open on a warm night, allows easy access to potential criminals. Despite people thinking that they are careful enough, burglaries are still very common. However, the weak points leading to most burglaries today are somewhat hidden. You can fix them easily. Just making a few changes, additions or modifications of behaviour can help you become a less appealing target. A properly secured property provides extra appeal for both the insurers and the prospective tenants. The improvements do not cost a fortune if you know a few tricks. Let’s check out these low-cost ways to secure your property. Checking the locks on windows and doors can be a good point to start with and in most cases, absolutely compulsory. Adding padlocks to garden gates, front and back doors makes it difficult for intruders to break in. Peep holes at front doors allow residents to identify visitor before rushing to open the door. Street and house numbers should be clearly visible to allow emergency services find your property with ease. Add an extra bolt or door closer to back door, which will stay locked when residents are leaving through the front door. Signs or window stickers saying “These premises are under CCTV surveillance” or “Beware the dog” can warn the burglars that the property is secured with alarms, even if there is no dog or alarm there. Motion-sensitive security lights run by solar power can be very effective and cost-efficient. Sheer curtains can help to prevent the burglars to check out what’s available inside for stealing. Security screens r grilles at windows and doors provide a good barrier against burglars. Use small household safes, which are available at a very cheap price. 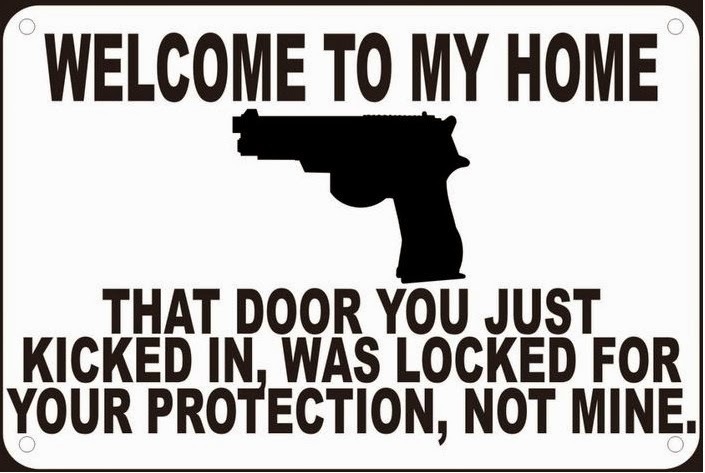 Use an alarm system. There are different types of home security systems including monitored, self-monitored, wired and wireless systems, available at different pricing points. When you’re not at home, remember to keep all your doors and windows locked. Don’t leave around ladders, garden tools or stuffs like that outside as they can be used to break into your property. It’s wise not to write your address on random items like a key-ring. Spare keys should not be left outside your home. Expert thieves know how to find them. Don’t leave your car keys at a location where it’s visible from the windows. When you go on a holiday, stop all mails and deliveries. Maintain good relationship with neighbours. Posting about your holidays over social networking sites can alert the thieves that your home is unoccupied. Make sure your privacy settings are fine before posting any credible information. Always have an inventory list prepared of all your valuable items including the detailed descriptions, makes, models, serials and price, in case you need to claim for insurance in the future. It’s a good idea to take photos of the items as well. Engrave more solid possessions where possible with specific markings such as your special code or driving licence number. By marking your possessions, not only do you stand a higher chance of recovering your personal belongings but it also makes it harder for the thief to sell your items. Insurances can be a good way to secure your property in case of burglaries or intrusions. Houseowner insurance is the most popular and effective insurances for protecting your precious property. It is quite cheap compared to other insurance policies. In general the premium of houseowner insurance is less than 0.3% of property’s value and less than 1% of contents’ value. The biggest benefit of houseowner insurance is that your investment will be fully protected. You will never have to worry about anything bad happening to your property. Houseowner insurance pays you for loss or damage to the building including fixtures and fittings, interior decorations, walls, gates and fences caused by specified perils, such as theft and violent breaking into or out of the building. Some houseowner insurances even cover loss or damage due to fire, lightning, explosion caused by gas, riot, landslip, etc., which are more extensive than fire insurance. There are even some insurers offer extended coverage to personal valuables and liability. CCTV or security cameras is a great way to protect your property from burglary. It’s a great asset for both single-family or multi-family properties. They can help to monitor the driveways, parking lots and the exterior boundaries of your property to make sure that all criminal or suspicious activities are recorded. Just like any other investment property, a security system at residential homes can make you feel more secure. When set off, these security systems will alert you with a loud, blaring alarm and alert the security companies and other authorities. It’s an excellent way to protect your tenants and also for alerting you to trouble. It’s really helpful particularly when your properties are vacant and the residents or tenants are not on site. Dogs are said to be man’s best friend for a reason. Apart from being your constant companion, they are great protectors of your home security. Guard dogs and watch dogs are different. If you’re looking for watchdogs, small, excitable breeds are the most suitable ones as they have a ear-piercing and high pitched bark. However, watchdogs are not able to fend off any unexpected intruders. For that, there is the guard dog. They will attack any unwelcome visitor and its bark is good enough to scare off the intruders. Guard dogs do whatever they can to protect the owners. They can be really loyal ones if they are well-trained and nurtured. If you want full protection of your home, you should not leave that responsibility solely upon your dog. You can’t really put a price on the safety of your family. So the best way to ensure total protection of your property is to have both a dog and a good home security system. Now how can you find the perfect balance between cost and security of your property? It’s all very relative. If you have a small single-family home, it’s probably enough to have a guard dog and an inexpensive home security system. You definitely won’t need a high-tech, super expensive security system used in a bank vault. So it all boils down to your priorities. Security systems are available at varying price points and depending upon your need. Choose the best security system for your property and stay safe and secure! This article was co-written with KCLau of KCLau.com and published in February 2015 issue of Property Insight magazine.